Not to be confused with Coeliac disease. Not to be confused with Cerelac. Celeriac (Apium graveolens var. rapaceum), also called turnip-rooted celery, celery root, or knob celery, is a variety of celery cultivated for its edible stem or hypocotyl, and shoots. Despite its name, it is not a close relative of the turnip. Celeriac is like a root vegetable except it has a bulbous hypocotyl with many small roots attached. In the Mediterranean Basin and in Northern Europe, celeriac is widely cultivated. It is also cultivated in North Africa, Siberia, Southwest Asia, and North America. In North America, the 'Diamant' cultivar predominates. The root is cultivated in Puerto Rico, sold locally at farmers' markets and supermarkets, and is a traditional staple of the Puerto Rican kitchen. Celeriac originated in the Mediterranean Basin. It was mentioned in Homer's Odyssey as selinon. Typically, celeriac is harvested when its hypocotyl is 10 to 14 cm (3.9 to 5.5 in) in diameter. However, a growing trend (specifically in Peruvian and South American cuisine) is to use the immature vegetable, valued for its intensity of flavour and tenderness overall. It is edible raw or cooked, and tastes similar to the stalks (the upper part of the stem) of common celery cultivars. Celeriac may be roasted, stewed, blanched, or mashed. Sliced celeriac occurs as an ingredient in soups, casseroles, and other savory dishes. The leaves and stems of the vegetable are quite flavoursome, and aesthetically delicate and vibrant, which has led to their use as a garnish in contemporary fine dining. The shelf life of celeriac is approximately six to eight months if stored between 0 °C (32 °F) and 5 °C (41 °F), and not allowed to dry out. However, the vegetable will tend to rot through the centre if the finer stems surrounding the base are left attached. The freshness of the vegetable can be determined by viewing the hollowness of the vegetable; a fresh celeriac should not have a hollow centre. The freshness of the vegetable will also be obvious from the taste; the older the vegetable, the less potent the celery flavour. ^ "Growing Crops: Celery and Celeriac". Urban Organic Gardening. 17 June 2011. Retrieved 28 January 2012. ^ a b c d Schuchert, Wolfgang. "Celeriac (Apium graveolens L. var. rapaceum)". Crop Exhibition. Max Planck Institute for Plant Breeding Research. Archived from the original on 20 May 2012. Retrieved 28 January 2012. ^ a b Chisholm, Hugh, ed. (1911). "Celery" . Encyclopædia Britannica. 5 (11th ed.). Cambridge University Press. p. 500. ^ Watson, Molly. 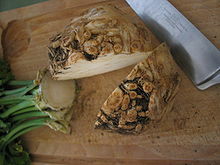 "All About Celery Root (Celeriac)". localfoods.about.com. Retrieved 29 April 2014. ^ a b "Celeriac (Apium graveolens rapaceum)". Desirable Vegetable Varieties, By Vegetable. The Owlcroft Company. Archived from the original on 20 May 2012. Retrieved 28 January 2012. ^ "eat celery root". eattheseasons.com. 2010. Retrieved 29 April 2014. ^ a b "Small-scale postharvest handling practices - A manual for horticultural crops - 3rd edition". FAO Agriculture and Consumer protection. March 1995. Retrieved 29 April 2014. This page was last edited on 20 April 2019, at 07:01 (UTC).